This is the sharpest image of Saturn's temperature emissions taken from the ground; it is a mosaic of 35 individual exposures made at the W.M. Keck I Observatory, Mauna Kea, Hawaii on Feb. 4, 2004. HONOLULU (AP) -- Astronomers using a giant telescope atop a volcano have discovered a hot spot at the tip of Saturn's south pole. The infrared images captured by the Keck I telescope at the W.M. Keck Observatory atop Mauna Kea on the Big Island suggest a warm polar vortex _ a large-scale weather pattern likened to a jet stream on Earth that occurs in the upper atmosphere. It's the first such hot vortex ever discovered in the solar system. 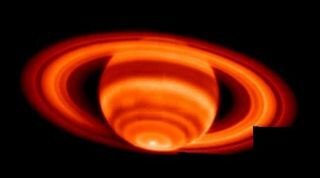 The team of scientists say the images are the sharpest thermal views of Saturn ever taken from the ground. Their work will be a published in Friday's editions of the journal Science. This warm polar cap is believed to contain the highest temperatures on Saturn; the scientists did not give a temperature estimate. On Earth, the Arctic Polar Vortex is typically located over eastern North America in Canada and plunges cold arctic air to the northern Plains in the United States. Polar vortices are found on Earth, Jupiter, Mars and Venus, and are colder than their surroundings. The new images from the Keck Observatory show the first evidence of a polar vortex at much warmer temperatures. "Saturn's is the first hot polar vortex that we've seen because it's been sitting in the sunlight for about 18 years," said Glenn S. Orton, a scientist at NASA's Jet Propulsion Laboratory in Pasadena, Calif., and lead author. Saturn, which takes many earth years to orbit the sun, just had its summer solstice in 2002. "If the increased southern temperatures are solely the result of seasonality, then the temperature should increase gradually with increasing latitude, but it doesn't," Orton said. "We see that the temperature increases abruptly by several degrees near 70 degrees south and again at 87 degrees south." "A really hot thing within a couple degrees of the pole is something I don't understand at all," he said. Scientists may learn more from the data coming from the infrared spectrometer on the Cassini spacecraft currently orbiting Saturn, information that is expected to complement the Keck discovery, Orton said.